WaterBrick Stackable Water Container and Food Storage Container: 3.5 Gallons of Liquids or up to 27 Pounds (264 Adult Servings) of Dry Foods. Made of rugged, high density polyethylene (HDPE) with an easy grip comfort handle. These unique water containers, unlike any other, can also hold food and other life essentials while adding value by cross stacking up to 4 feet for maximum efficient storage. Wide diameter lid opening with notched easy grip lid allows for an average adult to pull stored contents out of the container by hand. Stores water, food or anything you want to keep dry or store efficiently while eliminating most food odors. Grab and go convenience - easy to carry handle. Use at home or on the go. Great for camping or when you have to leave in a hurry. Small enough to tuck away into tight spaces. It is recommended to use approximately 1 gallon a day for drinking, food preparation and basic hygiene or 1/2 gallon a day for drinking only. Use to build life size forts that can change as easily as your child’s imagination or stack and store small toys. o Fill with Sand or Pea Gravel similar to how traditional sand bags are used. 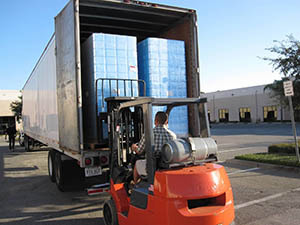 WaterBricks can be cross-stacked up to 4 feet high and take up less space than standard 55 gallon drums. WaterBrick containers can be easily accessed for portable and clean water during emergency situations as part of a 3 day grab and go kit. They are ideal for Preppers, survivalists and even families who are preparing for upcoming natural disasters or power outages. Structural Engineering Certification by Wilson Structural Consultants, Inc.
Ardaman & Associates, Inc a Geotechnical, Environmental Materials Consulting firm issued their 18 page report that proved WaterBrick to be capable of withstanding the structural requirements to be used in building a range of facilities. This testing represents a significant milestone as it shows that a WaterBrick wall could support trusses spanning up to 85 feet! Given that our buildings would all have truss spans well within this parameter, WaterBrick can support point loads from wood trusses for a variety of truss spans with or without a top plate. 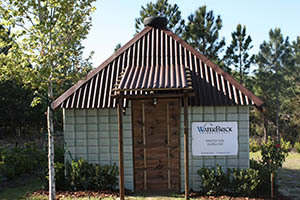 This is a testament to WaterBrick's structural capabilities. Individual needs vary, depending on age, physical condition, activity, diet, and climate. 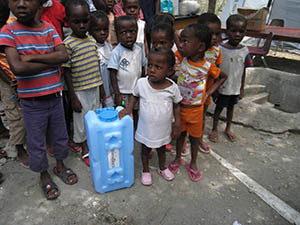 Children, nursing mothers, and ill people need more water. Very hot temperatures can double the amount of water needed. Also recommended is adding a water preserving agent such as Water Preserver™ or Oxy-Stabile Water Preserver. Both of these products state that users can effectively store water for 5 years by purifying and keeping water bacteriologically safe. These products can be used with regular tap or bottled water and are highly recommended by users. It all started as a challenge. A dare if you will. “Find a way to deliver fresh water to the millions of people who die everyday around the world because they lack fresh water or have tainted water,” Cousteau answered. A centuries-old distribution dilemma dropped in the lap of a water novice. Behind a perpetual smile and a slight Southern accent, Wendell is just the type of man to take up the gauntlet when it’s been thrown down. after natural disasters. A container. Tough, light-weight and multi-purpose. Adams came up with WaterBrick. Think of a “Lincoln Log” when you were a kid. A molded plastic, hollow container with a lid and a handle. But shaped to interlock and stack efficiently. WaterBricks can be filled with water, food, medicines, seeds. You name it. Stacked on palettes, they can be dropped by parachutes from an airplane after a natural disaster or in a warzone and survive the landing. They can be trucked hundreds of miles without leaking and use every inch of truck bed space. So, now desperate people have the minimal basics. Clean water. Food. Medicine. But, Adams had a further idea. These people often lived in tent cities or had no shelter at all as refugees displaced by disaster or war. Once the WaterBricks are emptied of their contents, they can, of course, be reused. They can also interlock and, filled with sand or gravel, be stacked to make fully weight-bearing shelters, MASH hospitals, latrines, even schools. They don’t require tools to assemble. WaterBricks began rolling off the line in 2008. Then, IT happened. January 2010. A powerful earthquake pancaked Haiti. Two hundred thousand people killed and more than 1 million displaced in a country which has had nothing to begin with. 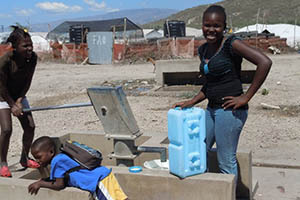 Working through rescue services, NGOs and UN relief efforts, WaterBricks finally arrived in Haiti with strong corporate sponsorship and the out-of-pocket efforts of Adams. As in all such disasters it seems, worldwide media attention was 24/7. Then, the cameras left for the next crisis du jour and the Haitians were left behind. The world blinked. That’s when the next unnatural disaster arrived. A small cadre of relief workers brought the cholera bacteria with them to a weakened nation with no infrastructure or capacity to handle it. 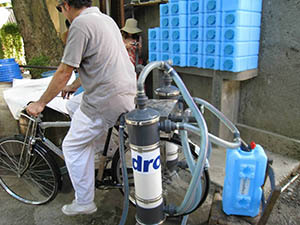 Cholera is often bourn by infected water. There have been 470,000 cases of cholera in Haiti and over 6,600 deaths—old and very young, women and children, families. 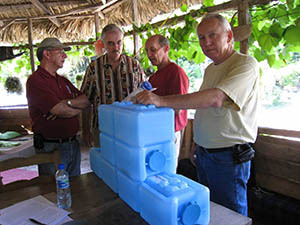 Now, WaterBricks have become tools of long-term survival, keeping clean water separated from water tainted by disease. “We’ve shipped about 17,000 so far and we keeping looking for partners who can help with funding and making sure the containers actually get to them people who need them,” Adams says. Sometimes it’s discouraging. In this place, you can destroy everything but corruption, greed and the linings of pockets. None of this stops Adams. The demand for WaterBricks has surpassed supply worldwide. He’s trying to find more manufacturing capacity—this time in Asia. Why? Fukushima, Japan. March 2011, an earthquake and tsunami triggers a nuclear reactor meltdown. Towns wiped out and water laced with radiation. Even now, the sheer fear of another such event has people throughout Asia wanting WaterBricks to store just in case. In a footnote, researchers and students at New York University are using WaterBricks for radiation tests of gamma and neutron test walls for water at nuclear power plants. There’s a vernacular for everything. “WaterBrick” is a good, descriptive brand name. To Adams, it’s a “safe storage intervention product.” It makes us remember. On the faces of small children carrying an “intervention product,” this is very serious business.